Information on hazards in our community! ​2110 N. GAFFEY STREET, SAN PEDRO!!!!!!! An informed public is a positive force for our families' safety. Our homes were here BEFORE these tanks were built! The City of LA KNEW they were allowing the Liquid Petroleum Gas (butane) tanks to be built on the PV Fault and in a liquefaction zone. The Port planned and built "Energy Island" as a safe-haven for hazardous facilities. Congresswoman Jane Harman secured MILLIONS of Federal tax dollars to build the island predicated on Public Safety! Instead it's become a container terminal! A recent "Risk Analysis" of this facility estimates a blast radius from an EXPLOSION at Rancho LPG could exceed 6.7 miles!!! Within a 3-mile radius we estimated there are 20 elementary schools, 9 high schools, 2 hospitals, 9 LAFD and LAPD stations, the Coast Guard HQ, Harbor College, the Vincent Thomas Bridge, 110 Freeway, the Port of LA, many churches, and thousands of homes and businesses. Review the report below, as well as other documents related to this issue. (Some of the files below are large and may take a few minutes to download). September 4, 2012. Letter to: ANDRE BIROTTE, Jr.
| Retired Industry Expert Joins Rancho LPG Fight. Read article in Random Lengths News. Commentary by J. Dexter Peach to Congress. View Info. Powerpoint Presentation of At Risk Area. Download the PDF version here. Quantitative Risk Analysis for Gaffey St. Butane Storage Facility. Report can be downloaded hereDemonstration and Explanation of a BLEVE. Click here to view the U-Tube video. Related letters sent. Hazmat, LAUSD, City Planning Dept, & RPV City Council. Is the Rancho LPG Holdings, Petroleum Storage Facility at 2110 N. Gaffey, San Pedro, an "Ultrahazardous Activity" as defined in the Restatement of Torts 2nd? See Document and Exhibits. Los Angeles Times Article and also San Pedro News-Pilot article from 1979. View articles. LA Times Article from July 16, 1977. View article. LA Times Article from April 4, 1977. View article. Response to letter sent to LA County District Attorney's Office Consumer Protection Division by Anthony Patchett, Esq. View letter. Document related to similar issue in the City of Elk Grove, CA including comments on Negative Declaration. View document. SAFETY ELEMENT OF THE LOS ANGELES CITY GENERAL PLAN.View Document here. Rancho/Plains Oil Accident in Canada: Paste the following link into your browser. Community Poses Tough Questions About San Pedro Butane Tanks. Watch NBC video. Paste the following link into your browser. Korea 1998 Explosion of LPG Filling station, tank truck, and underground storage tank. "A Bleve within a Bleve...within a Bleve" This storage facility contained a fraction of the volume of Rancho LPG. 1/27/2012: Janet Gunter talks about the issue with Ron Kilgore on KFWB. Download mp3 file here. 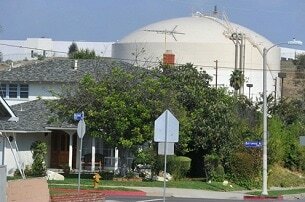 San Pedro residents revive debate about gas storage tanks' safety. Link to article. Watch this You Tube Video of a 50 Cal weapon vs. a Small Propane Tank. Who has access to weapons like this? Click on this link to find out: Weapons turned in to the LAPD during Buy Back program; Rocket launcher weapons as a means of terrorism or nuisance behavior. http://www.cbc.ca/news/canada/calgary/story/2012/06/09/calgary-sundre-oil-spill-update.htmlCommunity Poses Tough Questions About San Pedro Butane Tanks.